Click here for Request for Help form. 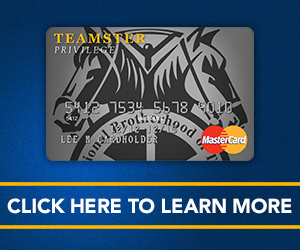 Teamsters Jo int Councils are set up in areas with three or more local unions. Joint Councils help coordinate Teamsters activities in those areas. They also solve problems, jurisdictional disputes and judicial matters. 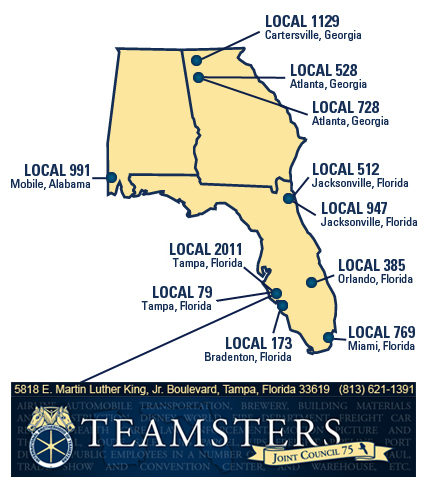 In Joint Council 75, there are 11 local unions within the states of Florida, Georgia and southern Alabama, representing more than 38,000 members. Throughout JC 75 jurisdiction local unions administer about 170 different contracts with our members in more than 500 different locations. The membership is very diversified and works in a variety of different jobs: Airline Automobile Transportation, Brewery, Building Materials and Construction, Disney World, Fire Department, Freight, Car Rental, Health Care, Law Enforcement, Motion Picture and Theatrical, Route Sales, UPS Parcel, UPS Freight, Pipeline, Port Division, Public Employees in a number of different jobs, Tankhaul, Trade Show and Convention Center, and Warehouse, etc. Each Local Union within the Joint Council is committed to organizing the unorganized and have established partnership programs with the Joint Council and the IBT in their organizing efforts. Since 2000, the Joint Council has grown by almost 18% in membership which is a direct result of our organizing commitment. Each Local Union is also very committed within the political arena on a local, state and federal level. We are located at 1210 Lane Avenue North, Jacksonville, Florida 32254 and you can contact us at (904) 786-7971, by fax at (904) 378-1999, or email us at admin@teamstersjc75.org.